IRVING PARK — Bob Koester can’t quit the record business. 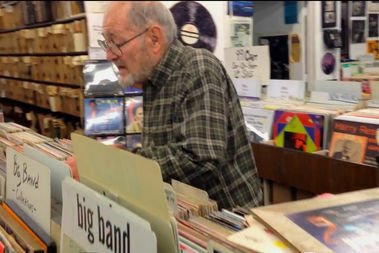 At 83, Koester could be forgiven for kicking back after closing up the Jazz Record Mart, a Chicago fixture since the 1950s, earlier this year. But Koester, who also owns the Delmark Records label, doesn’t know the meaning of retirement. “I’m gonna die in the saddle, I think,” he said in a recent interview with Forward Chicago. Though he sold the Jazz Record Mart’s inventory to Wolfgang’s Vault back in February, Koester has since collected enough LPs, in addition to Delmark’s catalog, to open a new shop: Bob’s Blues & Jazz Mart at 3419 W. Irving Park Road. “People kept offering me collections, and I kept buying them,” Koester told the Tribune. To celebrate the store’s grand opening, Koester, who was inducted into the Blues Hall of Fame in the ’90s, is hosting free in-store performances Saturday and Oct. 29, which coincides with his 84th birthday. Swing by at 1 p.m. Saturday to catch Studebaker John in concert. Blues guitarists Lurrie Bell and Johnny B. Moore are scheduled to play at 1 p.m. Oct. 29. Bob’s Blues & Jazz Mart is open 10:30 a.m.-6 p.m., Monday through Saturday. , a Chicago fixture since the 1950s, earlier this year. “People kept offering me collections, and I kept buying them,” Koester told theTribune. Swing by at 1 p.m. Saturday to catch Studebaker John in concert. Blues guitaristsLurrie Bell and Johnny B. Moore are scheduled to play at 1 p.m. Oct. 29.